Day 1 was only half a day, since our Garuda flight didn't arrive until lunchtime. Hurray! I may actually get a blog post up this Easter weekend. After this, I'm going to divide up by subject — street scenes, batik, vegetation, etc. — so that I don't end up with a hundred photos to patch into one post. The reasonably-priced, soi-disant "boutique hotel" south of central Yogyakarta that Michael had found on the internet turned out to be very attractive. The only minor flaw was a rather feeble air conditioning system that couldn't cope with the heat the first night. After that the weather cooled off and we slept comfortably, so it didn't matter that we only discovered the ceiling fan as we left the room to check out. Oddly enough, sleeping warm bothers me more than Michael: I've never forgotten Philadelphia summers when Cheri and I slept with our heads at the bottom of our twin beds in hope of bit of cross-ventilation from the screened windows in our shared room. Continuing the cicak theme (small household lizard that helpfully consumes lots of insects). View from our balcony, aka smoker's retreat. nJoglo Restaurant (a joglo is a traditional Javanese pavilion). View from what became our favorite table. Michael loved this wonky chandelier, so we have day and night photos. Loro blonyo figures, larger sitting versions of the kampung pair we have in our bedroom. Our Dewi Sri and Sadono (about 19 inches tall, purchased at the Four Seasons gift shop in Jakarta) would have sat on the dirt floor of a village home, hence the damage to the wood at the back. Postscript added 24 April. Here's our newly-purchased second set of Loro Blonyo figures (one for London, one for France — as I explained to Michael). Various vintage items added to the Raffles-like feel of the hotel. Passage from lobby to pool area. The swim-up bar. We never got home early enough on Saturday and Sunday for Michael to take advantage of this. Daru, our driver for Friday afternoon. Our itinerary: Winotosastro workshop (photos of batik-making process to be saved for later, but picture of the fabulous cinnabar-colored silk weaving we bought there is at end of this post); Lenan "Pearl of Silk" at Jl. Patehan Lor 18; Kota Gede, the silver center. Michael was extremely patient as we spent a long time in the late afternoon heat trying to find the residential address on the business card I had for once managed not to lose. We succeeded in the end, but the metal shutters were down. Our driver eventually roused the girls looking after the shop annex, who graciously opened up for us. Unfortunately, there were no blue weavings, but Michael spotted a wild silk selendang (long rectangle of cloth worn draped over women's shoulders) in a surprisingly beautiful shade of brown, not usually a color I'd choose. 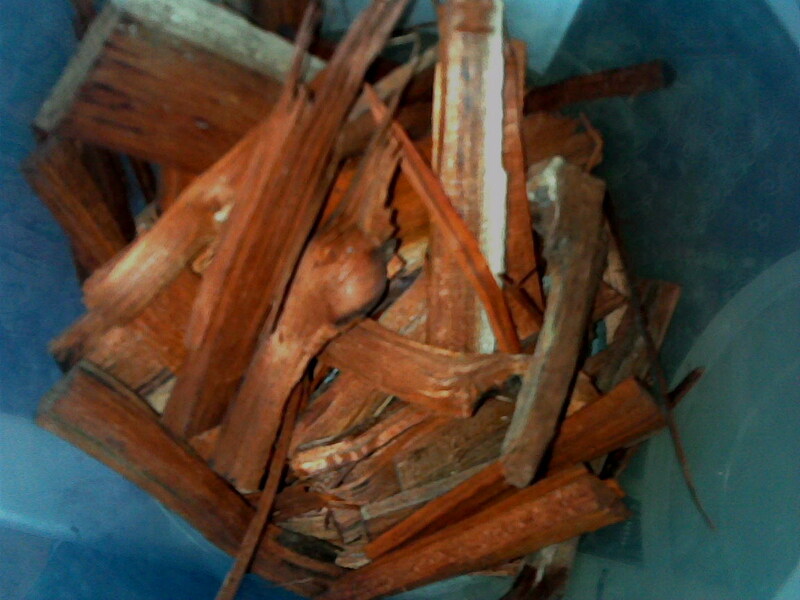 The wild silk was spun from cocoons on mahogany trees, then dyed with natural color from jambal kayu. Raw material for creating warna alam (natural dye). 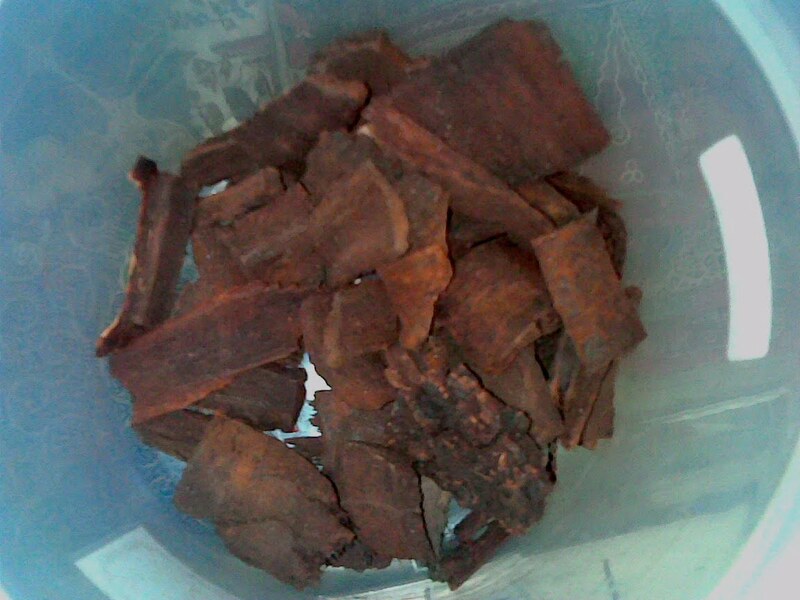 Photo of jambal, taken from batik website. 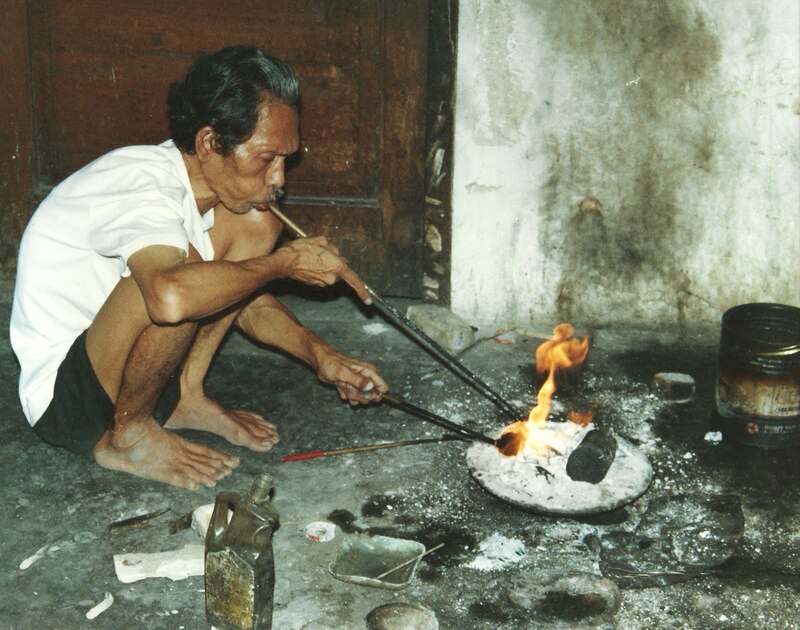 And from the same site, a picture of secang, the source of the color for our Winotosastro red silk. 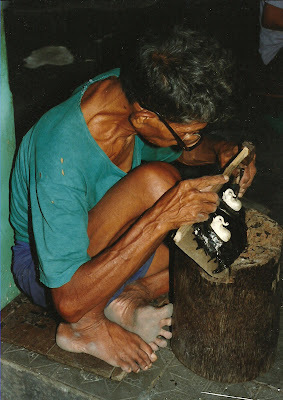 Both jambal and secang are from kayu (wood). The pleasant and helpful young girl who sold us our wild silk selendang. Our driver outside the house/shop. Our last goal for the first day was to revisit Kota Gede and see if silversmiths were still hard at work right next to the streets as they had been 25 years ago, when we last visited Yogyakarta. The answer appeared to be NO, and I'm pretty sure we managed to get across to the driver exactly what we were looking for. Instead we were taken to a silver store, with a workshop attached to draw in tourists. Interesting enough, but a far cry from the atmosphere we remembered. Most of the silver was too ornate and all of it was too expensive. Some sort of naturally sudsing material, used to clean silver pieces. Superb photos Michael took on our previous visit, a reminder of how much has changed. Little did we know these would now seem archival.